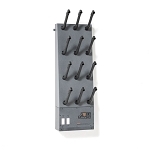 The GearDryer Wall and Floor 6 pair is made from heavy-duty steel with a durable powder coat finish, plugs into a standard wall socket, and features 12 individual dryer ports that can accommodate up to 6 pairs of boots or gloves. 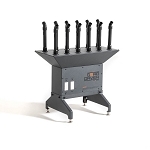 GearDryerâ€™s unique twist and lock port design allows you to customize the port layout to create the perfect drying system for a wide range of gear items. Please call us if you have any questions at 610 761 7340.